Since the release of 'The Whippoorwill' in 2014, Atlanta's Blackberry Smoke has been on an upward trajectory. I loved the more raucous Brendan O'Brien-produced 'Holding All The Roses' that followed, but it was an album that divided opinions, with many people finding it over-produced, while also preferring the slightly mellower material that dominated '...Whippoorwill'. Those in question then, may be pleased to find that this fifth offering is once again a self-produced effort (recorded in a matter of days) that mostly leans back towards '...Whippoorwill' in style. 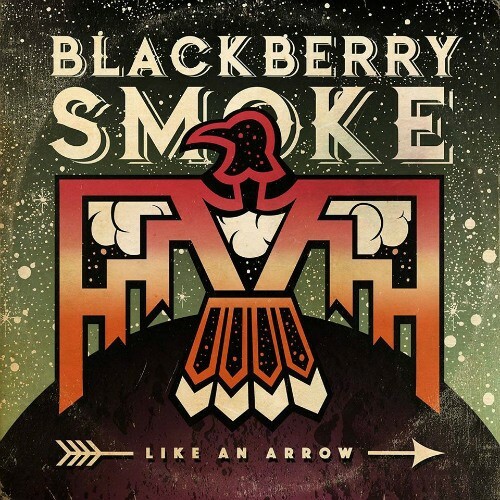 Though still combining the blend of Southern, Country, Blues and Rock 'n' Roll that BS do so well, 'Like An Arrow' is a predominantly laid-back album in comparison to its predecessor. That said, opening cut (and first single) 'Waiting For The Thunder' and the title-track are two of the heaviest tracks the band have ever committed to tape, full of crunching Southern riffs and Led Zeppelin swagger, with no small amount of Psychedelia twisting through the dirty riff of the latter. The liveliest cut is the almost Rockabilly 'Let It Burn', classic BS shot through with Honky-Tonk piano, while 'Workin' For A Workin' Man' injects a final burst of pace as the album draws towards its conclusion. Elsewhere, '... Arrow' rarely rises above a canter. The more Country side of the band comes to the fore on the meandering 'Running Through Time', the acoustic 'Ain't Gonna Wait' and the touching ballad 'The Good Life' – the latter containing the type of lyric only Lynyrd Skynyrd can normally get away with – while the mournful 'Sunrise In Texas' is a Southern slow-burner. Though essentially mid-paced, it's not all balladry, with the cheeky 'What Comes Naturally' (think Aerosmith's 'Rag Doll' with a Southern slant), the Rolling Stones-esque 'Ought To Know', the slightly Funky 'Believe You Me' and the groovy Blues of 'Free On The Wing' (featuring a guest spot from Gregg Allman). 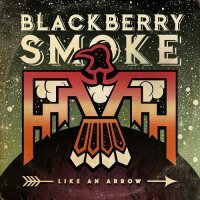 It's definitely not the type of album I was expecting from Blackberry Smoke, especially after hearing the raucous '...Thunder' as the precursor to the record. But, after giving it plenty of the required time it warrants, the melodies began to seep through and, with the addition of the intriguing lyrics and excellent guitar work of Charlie Starr, I find it just as irresistible as everything that has preceded it.